Paderborn, 20th August 2014 (ugw). 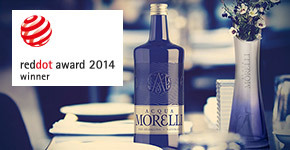 The “regal” glass bottle for premium water ACQUA MORELLI has been awarded the coveted Red Dot Design Award in the Communication Design category. That makes the designer Florian Gerdts and the beverage company MBG International Premium Brands a winner for the second year running. The Red Dot is awarded to products and items of particularly outstanding visual quality from various branches of industry, following careful assessment by an international panel of experts. The pure, light taste of natural mineral water ACQUA MORELLI, which contains an extremely low quantity of minerals, makes it the ideal accompaniment to fine cuisine and choice wines. What’s more, the high-quality bottle design of this premium water is a real eye-catcher on any table. Elegantly embossed flourishes adorn the single-serving bottle in deep cobalt; a shimmering silver label is a bold statement in itself. The straightforward clarity of the design symbolises the liaison between purest mineral water and exclusive gastronomic culture: an unusual gourmet experience within, enclosed by a grand exterior full of character.